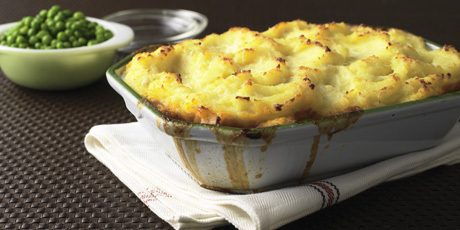 Warm, comforting and an instant classic. 1. Add 2 tbsp vegetable oil to large saucepot over medium high heat. Add ground beef. 2. Allow excess liquid to bubble away; stir and cook until meat is well browned and crispy, about 8-10 minutes. Drain excess fat using a colander. 3. Deglaze pot with red wine, scraping up browned bits and let reduce slightly. 4. In another large pot, add remaining vegetable oil over medium high heat. Add onions, carrots and celery; cook until golden, about 5-7 minutes. 6. Add in red wine from deglazing beef, scraping up crispy brown bits from bottom of pan. 7. Add beef stock, rosemary, thyme and bay leaf. Return browned meat to pot. Simmer, covered for 20-25 minutes. 8. Remove lid and continue cooking for another 10 minutes; liquid will reduce and thicken. Remove rosemary, thyme and bay leaf. Season well with salt and pepper. 1. Add quartered potatoes and smashed garlic to medium pot. Fill pot with cold water just to cover potatoes; season cooking water well with salt (it should taste like the sea) and bring to a boil. 2. Boil on medium high heat until potatoes are tender but not overdone, about 15-20 minutes. 3. Strain potatoes; let dry out slightly in colander before returning to pot. Add cream, butter, pepper, Parmesan cheese and more salt if necessary. 4. Mash roughly with fork or potato masher. 1. Preheat oven to 400. Spoon filling into the bottom of a 10-inch round casserole dish. Top with potatoes. 3. Bake on middle rack until top is golden and filling is warmed through, about 20-25 minutes. Let stand for a few minutes before serving. 1. Heat vegetable oil in a medium pan over medium high heat. Saute bacon until light golden. 2. Add sliced onion and sauté until onion is translucent and just starting to colour. Add cabbage and sweat, cooking down until cabbage softens, about 5 minutes. 3. Blanch peas in a pot of boiling salted water. Drain and add to cabbage mixture. Add butter and fold to coat lightly. Season to taste with salt and pepper.